The trio played “Runnin’ With the Devil,” “You Really Got Me” and more at the Whisky A Go Go. The shock rock legend joined John 5 and his band onstage in Mesa, Arizona. The band is currently out on a North American tour in support of forthcoming album 'Invasion." 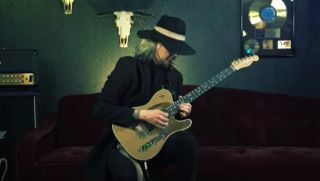 John 5 and the Creatures Share New Song, "Crank It—Living With Ghosts"
Animated clip features voice cameos from Nikki Sixx, Cinderella's Fred Coury, others. The guitarist will head out on a North American tour in February with Jared James Nichols supporting. Other confirmed performers include Corrosion of Conformity, Armored Saint and DevilDriver. The beautiful Fender has a custom Sonic Blue finish.